Belly warming and hearty, a slow stewed ham bone stock is finished with drop dumplings. 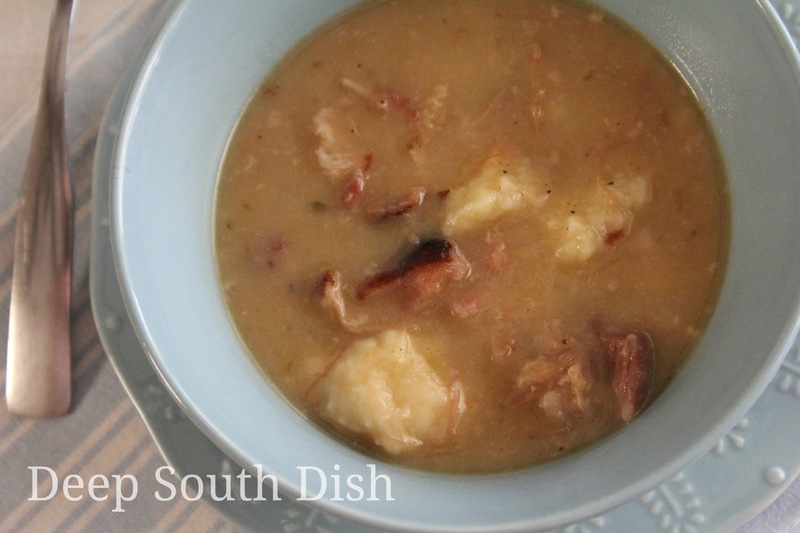 In the south, we'll drop some biscuit dough in just about any dish with a soup or stew consistency - beans, soup, stews, they're all game. All dumplings require is a full bodied stock and you're in business. Starting ham and dumplings with a nice leftover ham bone, or absent that, a couple of meaty ham hocks, makes for a beautiful, rich stock base. The freezer preserved leftover holiday ham bone makes ham dumplings a pretty common thing in the first of the new year, especially when the weather outside's been frightening. Hey y'all, I know it's nothing like what our friends to the north face, but it's even been damp, dreary and downright cold down here in the Deep South of Coastal Mississippi! As I write this, I am seeing sunshine out of my office window for the first time in what seems forever. In years past, that ham bone would have very possibly been from a nice country ham, but most of us use smoked half hams these days, buying our country ham more often by the slice in a cellophane wrapper, due to the cost. If you're lucky enough to have a country ham bone though, use it by all means, but either way don't salt the stew until you taste it, as any of the above will add a good bit of sodium already. I don't typically salt mine at all. Add a hunk of cornbread or French bread and you've got a hearty meal that'll keep you warm from the inside on these cold days. For chicken and drop dumplings I prefer larger dumplings, so I drop larger spoonfuls and cook a little bit longer. Yes, I am one of the bold southerners who proudly say that I enjoy fluffy drop dumplings in my chicken and dumplings, more than the rolled, flatter dumplings, although if you put both of them in front of me, I sure won't argue. I'll just eat, thank-you-very-much, and enjoy every single bite of both! You can roll and cut these into dumplings - just increase the flour a bit for a stiffer dough. For most other dumplings, such as these, I like the dumplings a bit smaller - not quite a teaspoon measure, but more of a soup spoon or even a tiny cookie scoop. By the way, I'll also be the first to say if a box of baking mix is a pantry staple for you, use it! I usually pick up a box during the holidays to make sausage cheese balls, and then I use it up on a few different baking mix recipes I love. It also makes a perfectly acceptable substitute for homemade dumplings, although I'll always tell you that homemade is freshest and best in comparison to anything boxed. Homemade dumplings are nothing more than homemade baking mix for biscuits anyway and not all that difficult to whip up, but frankly either will work and you can get away with canned biscuits too. If you have the time, make the stock a day before you want to make the dumplings. Stock made and left to sit in the refrigerator overnight until the next day always makes for a more full-bodied and flavorful dish in the end. That is exactly what I did with the stew pictured above. For those who might be interested, the dishes pictured are from Paula Deen's Signature Whitaker pattern in aqua. They were so pretty and with an understated elegance, I just had to have a set. I love them! Here's how to make my ham bone broth with homemade dumplings. Place ham bone in a large stockpot, along with the remaining stock ingredients. Bring to a boil, reduce heat and simmer, uncovered, for 2 hours or until mixture is reduced to about 1-1/2 quarts. Strain, reserving the bone and stock; discard vegetables. Once cooled, pick off any meat from the bone, reserving the meat and discarding the bone. Refrigerating the stock overnight is best when possible. When ready to prepare dumplings, set aside 1/4 cup of the stock. Mix together the dumpling ingredients until they form a soft dough. Bring ham stock to a rolling boil. Using a small spoon, scoop out and drop into boiling broth and cover immediately so that the dumplings begin to steam; simmer on low about 10 minutes before checking. Don't overcook or dumplings will be dense and hard. Taste broth and adjust seasonings if needed, adding freshly cracked black pepper. Carefully scoop broth and a few dumplings into individual serving bowls. Cook's Notes: May substitute 2 or 3 meaty ham hocks. 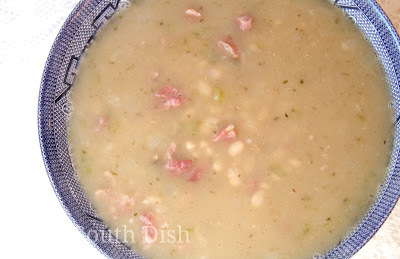 If the bone or hocks you use are not very meaty, add in about 1 to 1-1/2 cups of chopped, smoked ham. I love the title of his post and I'm with you on drop vs. rolled dumplings. :) I couldn't decide what I wanted to call this in the title - Ham and Dumplings, Ham Dumplings - but I thought Ham Bone Dumplings sounded about right, because, well, that's what they are! My grandmother made a similar dish but she made cornmeal dumplings. It was yummy! Wish I had that recipe. Just curious ... have you ever made cornmeal dumplings? Sure have - mostly with greens though. You can find a recipe here! I grew up eating the drop dumplings but I also like the rolled, flat ones. I was looking for something to cook this weekend & this recipe fits the bill. It's been cold here in central Virginia this winter but so far no snow or ice. Hope it stays that way. Hi Tricia! Our weather warmed up here a bit today and the sun was shining for the first time in forever, but the nights are still a bit chilly - which I don't mind at all! I hope that you enjoy the recipe! Thanks so much! It's included in the dumpling ingredient list so you add that in with the rest of the ingredients. Hope that helps! I have never heard of these but I love everything in them. 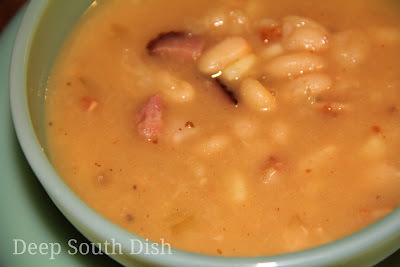 Kind of like a ham and bean stew/soup but without the beans. I definitely want to make this. Yep, that's pretty much what it is Chris! One day somebody decided to drop some dumplings in the bone stock instead of making beans or soup and voila, ham and dumplings was born! I made some ham bone stock this week from the ham bone in the freezer. But my son-in-law loves Split Pea Soup, so that is what happened to iy. Next ham bone, I am sooo making these dumplings! Can't wait to hear if you enjoyed it Janet!! Love your site, recipes, common sense, respect and humor. I love that you respond to the comments. Thanks for sharing and your hard work. Thank you so much - this note just made my day! I love to cook with ham bones!!!! I know this is delicious! They do add a lot of base flavor! Chop up an onion and add some to the individual soup bowls before eating. Both my dad and my husband both love their bean soup this way. I love the dumpling idea, and it is bookmarked for further reference. Thank you for the recipe! You're welcome & thanks for the onion tip! Hi Mary! I didn't test this recipe out for the slow cooker at this point, but it certainly should work. I'm just not sure if there are any adjustments that may need to be made. I had never heard of this before and now I can't believe I lived without it. What a great recipe. My ham bone made enough "jello" for a big pot of dumplings plus extra I froze for more down the road! Thank you for posting! I visit your blog almost daily. Thanks so much Myrna! Folks like you are what encourages me to continue doing this thing that I love doing!! My grandmother use to make ham bone dumplings all the time. It was one of my most favorite things to eat that she cooked. She use the ham hocks and make homemade dough for the dumplings, rolled it out and cut into about one & half in strips then cut the strips into about 2" the other way and drop them in to broth. I wish I could remember everything else she did with this dish but I can't. The dumplings would thicken up the broth and there would be small pieces of the ham from the hock in the dumplings. It was absolutely heaven. I wrote this recipe for drop dumplings. Your grandmother made the rolled dumplings. Either will work! 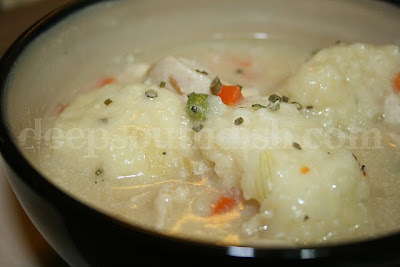 You can see more about my rolled dumplings here on this chicken and dumpling recipe. Hope that helps! Hi Mary. Was wondering if you could keep the vegetables in the stewstew? The vegetables will be pretty used up for flavoring the stock, however, you could certainly add some fresh veggies to the strained stock and let them cook before dropping the dumplings!